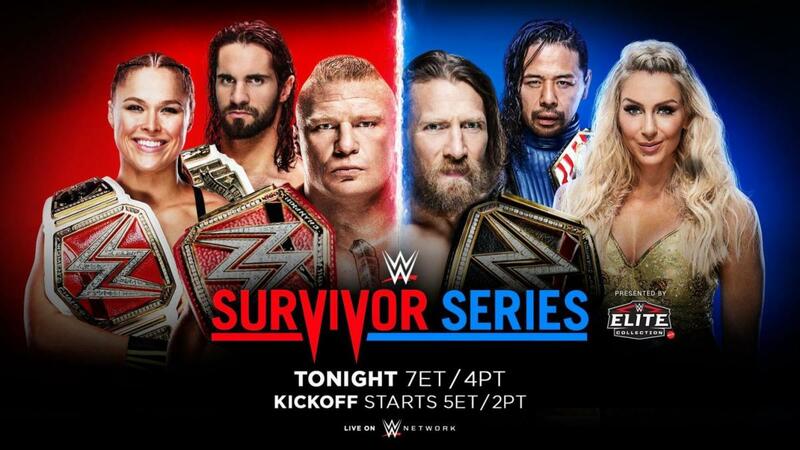 Survivor Series 2018 takes place at the Staples Center in Los Angeles, California tonight. There were a couple of changes to the card within the last week. After winning the WWE Championship from AJ Styles, Daniel Bryan will now face Universal Champion Brock Lesnar. SmackDown Women's Champion Becky Lynch is off the show due to injury, so Charlotte Flair will now take on Raw Women's Champion Ronda Rousey. Intercontinental Champion Seth Rollins vs. United States Champion Shinsuke Nakamura and Raw Tag Team Champions AOP vs. SmackDown Tag Team Champions Cesaro & Sheamus are also set for tonight. There will be three Raw vs. SmackDown traditional Survivor Series elimination matches: Dolph Ziggler, Drew McIntyre, Braun Strowman, Finn Balor & Bobby Lashley vs. The Miz, Shane McMahon, Rey Mysterio, Samoa Joe & Jeff Hardy, Nia Jax, Tamina, Mickie James, Natalya & Ruby Riott vs. Asuka, Naomi, Carmella, Sonya Deville & a partner, and Bobby Roode & Chad Gable, The Revival, The B-Team, The Lucha House Party & The Ascension vs. The Usos, New Day, SAnitY, Gallows & Anderson & The Colons (pre-show match). Cruiserweight Champion Buddy Murphy also defends his title against Mustafa Ali. The pre-show begins at 5 p.m. Eastern time, with the main card starting at 7 p.m. Some changes in the card. Lars Sullivan is being brought up. It came down to the Usos and Revival, with Jimmy pinning Dawson with a splash off the top rope. The Revival were the stars of the match but Dawson may have hurt his bad knee doing a tope as it was stuff later in the match. There was an everyone dive sequence which ended when Gable gave Jimmy Uso a superplex outside the ring onto everyone. Long match, the dive spot was great, the rest of the match was fine. No special heat but much better than a usual pre-show match. The Colons were out first, followed by the B Team and then Sanity (Eric Young & Killian Dain). Kalisto did a worked injury and he was replaced by Gran Metalik. Metalik & Lince Dorado did a double top rope Asai moonsault. The New Day was eliminated by the shatter machine when three teams were left. Chad Gable was pinned by the Midnight Hour before that. Gable looked good before he was eliminated. Nia Jax was the sole survivor pinning Asuka after three legdrops and the Samoan drop. Jax had super heat. Really the crowd wasn't much into this except when Jax was in where they booed everything she did. Jax also turned on Banks at the end. The work itself was solid. They tried to make Banks vs. Asuka into a big deal but it didn't across as big as I think they expected. Tamina pinned Naomi with a superkick right away. Carmella pinned Tamina with a schoolboy. Rose pinned James after Deville gave James a running knee. The idea is Rose stole Deville's win. Bayley pinned Carmella with the belly to belly,. Banks beat Rose with the banks statement. Bayley and Deville were both counted out of the ring when Bayley gave her a belly to belly on the floor. Jax then shoved Banks off the top rope, and Asuka used the Asuka lock on her, leaving only Jax and Asuka with Jax winning right away. Stephanie told Corbin that to be full-time GM Raw needs to sweep the night. Paige & Shane showed up. Long match. It felt slow early but built to a very good match. They did all the near falls and Rollins won clean with the curb stomp. Even though Smackdown won the tag team match it apparently doesn't count because they have a scoreboard that lists Raw now up 2-0. Rollins did a three tope spot early and later did the superplex and falcon arrow combination. The crowd was into it in the final minutes but it fell way short of being a classic. The Raw team is backstage. Braun Strowman said he didn't like you to Lashley, Ziggler and McIntyre. McIntyre saide he's the one who should be givign orders but me, I'm ending Shane McMahon. Strowman and McIntyre were arguing. R-Truth was backstage giving them a pep talk. Corbin said you're not on this team and to get out. Strowman wasn't allowed to touch Corbin so he threw Lio Rush into Corbin. Not much as far as the match went. The finish saw Drake Maverick being chased by Cesaro and he was running away and ran into Big Show. Big Show was choking Maverick and he did a gimmick to where he pissed in his pants. The Vince humor strikes again. The AOP then used their double team neckbreaker on Sheamus for the pin. The bigger news is that Enzo Amore was in the second row and got ejected. The crowd reacted to this but it never made the air. But it killed the crowd for the match. He was pretending he was cutting a promo. He was in disguise, stood up, thought the camera was on him, cut a promo and he was taken out. He started walking away. The security may have tried to take shots on him. Security took him out of the building. The Smackdown team was backstage for their pep talk. Miz called himself 2/3 of the best in the world. R-Truth was there. R-Truth asked Shane if he can join the Smackdown roster. Shane said he was on the roster. R-Truth wsa relieved saying Raw was a mess. This was a great match. The crowd didn't care about it early but they did all kinds of big moves and once Ali used a Spanish fly off the announcers table to the floor the crowd woke up. The crowd went from not caring to a “This is awesome” reaction. Murphy retained the title when he used a V trigger as Ali came off the ropes, the spot that Kenny Omega and Fenix did (Murphy studies Omega) and hit Murphy's law for the pin. Daniel Bryan was interviewed. Kayla Braxton asked him if he was ready for Brock Lesnar. He didn;'t answer. He still had two cuts on his nose from Tuesday. We have an unconfirmed report that Enzo has been banned from the Staples Center. Great match. Early on McIntyre pinned Joe in 35 seconds to eliminate him which really got the crowd mad since Joe is from Southern California. Shane McMahon did the elbow off the top rope putting Strowman through the table which took both of them out for a while. From there Mysterio pinned Balor with a 619 and springboard splash. Mysterio and Balor were great working together making you want to see them in a singles match. Shane, who was selling and with a huge bump on the side of his head (from before the match) did the Coast to Coast on Ziggler and pinned him again. The finish of the match saw Strowman make his return and he quickly powerslammed Hardy, Mysterio, Miz and Shane in that order to win. So Strowman, McIntyre and Lashley all survived and Raw is still unbeaten. Corbin attacked Strowman after the match and McIntyre and Lashley & Corbin all walked out on Strowman. Rollins did an interview and they announced in four weeks he defends the title agianst Dean Ambrose on the 12/16 TLC show in San Jose. They were having a very good match, rough in spots but had a very real sport feel that the other matches didn't have. Rousey's mouth was busted open from an inadvertent elbow. The big story is that Charlotte turned strong heel and got cheered like crazy and they did an angle where after the match Charlotte destroyed Rousey with kendo stick shots that left Rousey with brutal looking welts. Rousey was bleeding from the ear, mouth and her thigh was sliced and she had marks all over her chest, arms and back. It was one of the more brutal and intense post-match beatdowns you'll see. Charlotte put a chair around her throat and Rousey got Pillmanized. It looked like a major injury angle, but Rousey actually got up and they talked about her defending against Nia Jax. Charlotte was having trouble getting the chair in the right spot for the Pillmanizing spot, but it still worked. Fans were chanting “Thank you Charlotte” as she destroyed Rousey. This was a super heat angle and the reaction was the exact opposite of traditional. The idea of doing a super sympathy angle backfired as fans booed Rousey and ther were “You deserve it” chants and Rousey was really upset leaving because of the reaction. Fans were chanting “Becky” as she she left and she looked really mad. As for the match itself, Rousey won via DQ when, after a clean match, Charotte nailed her with a series of kendo stick shots. Rousey was clearly very upset with the crowd as they were doing the “You deserve it.” It looked like an injury angle but she left on her own rather than be helped out. They pushed Rousey's next match looks to be against Jax so this could be a storyline to take the title from her or at least sell that possibility. At one point in the match when it hit the high point and fans were chanting “This is awesome” both Rousey and Flair were visibly moved to tears. This was the best Lesnar match in a long time because of the story. The story is that Bryan taunted him early, but then Lesnar caught up to him and gave him all the German suplexes and overhead suplexes. They played on the idea of Bryan's neck injury because he took nasty looking German suplexes. Lesnar toyed with him and hit the F-5 and pulled him up. Bryan sold like he was dead and then Bryan kicked him a few times. Lesnar went to finish him with an F-5 but it took out ref Mike Choida, Bryan then gave him a low blow and running knee for a near fall. Then Bryan came back including working over Lesnar's leg. Lesnar went for the F-5 but his knee collapsed. Bryan then used the crossface and triangle for near submissions. So the deal here is Bryan was a complete babyface on the comeback even though he just turned. In the end Lesnar caught him with the F-5 and pinned him. Lesnar limped to the back. In many ways, playing off both Bryan's injuries and the fact people hate Lesnar's style match and they worked early like it would be a squash that people would hate and then Bryan made the big comeback, it was a brilliant match.